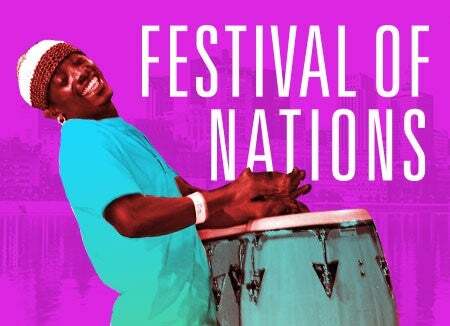 Festival of Nations, Minnesota's largest multi-cultural celebration, returns to Saint Paul RiverCentre Thursday, May 2 through Sunday, May 5. The event, which offers entertainment and educational opportunities for thousands of students on Thursday and Friday, opens to the general public at 3 p.m. on Friday, May 3. Festival of Nations provides a look into the traditions, history and journey of over 90 ethnic groups, and sheds light on how each one contributes to the American cultural landscape. We invite you to Celebrate without Borders at this annual Twin Cities experience, brought to you by the International Institute of Minnesota. This organization has worked to ensure immigrants and refugees achieve full membership in American life for 100 years through activities such as refugee resettlement, career development, education, and immigration services. Ifrah Mansour performs Somalia's Balloon on the Café Stage. In this short play, a young girl retells the colonial history of Somalia using balloons and movement. By exploring Somali history from a child's perspective, this work helps audiences learn about the history of Somalis in Minnesota. Saturday, May 4 - 2 p.m., 2:45 p.m., 3:15 p.m., 4:15 p.m., 5 p.m.; Sunday, May 5 - 2 p.m., 2:45 p.m., 3:15 p.m., 4:15 p.m., 5 p.m.
Burundi native speed painter DelStarr creates exciting live art experiences on the atrium stage. Friday, May 3 and Saturday, May 4 at 7 p.m.
Dance and music - Over 300 dancers and musicians perform on three stages throughout the festival. Cultural exhibits - Community members showcase their distinctive cultures through 40+ special exhibits highlighting traditional festivals in their native lands. Festival visitors can purchase a Festival of Nations Passport to be stamped at each stop. Ethnic cafés - Enjoy fare from all over the world at over 35 ethnic food cafés, including: Palestinian falafel, Colombian tamales, Tibetan mo-mos, Norwegian lefse, Lebanese tabouli, Nigerian moi-moi, and Vietnamese banh mi. Proceeds from each café benefit local non-profit organizations. Ethnic demonstrations - Folk artisans showcase crafts passed down through generations with over 30 interactive, educational demonstrations, including a Mongolian yurt and a Viking ship replica as well as Indian henna and Italian bocce ball. International Bazaar - Shopping from around the globe with booths representing 65 ethnicities, featuring imported gifts including clothing, jewelry and artifacts from many cultures.